Upon completion of the connector software installation, you’ll find that you have two new programs: Launchpad and Dashboard. I'll cover Launchpad first. The Launchpad shown in Figure 6 has a limited number of options and is intended to be used by the clients on their computers. Let's walk through the features. Backup - This option provides only two choices: Start Backup, which the administrator has pre-configured); and automatically wake up the computer to run a scheduled backup. Remote Web Access - Prior to using Remote Web Access, the administrator has to set up the DX4000 for remote access and configure user accounts to allow remote access. I’ll discuss that a little later. To access the DX4000 remotely, you open a secure HTTPS session to devicename.remotewebaccess.com (devicename is the name the administrator configured for the DX4000). This is basically a dynamic DNS service hosted by Microsoft that lets you bypass the hassles of router port forwarding (if you have a UPnP-enabled router...more later) and configuring your own dynamic DNS. After signing in with your username/password, you’ll land at the remote web access home page shown in Figure 7. Here you can see computers attached to the DX4000, view shared folders for which you have permission, and view the Media Library. The Media Library aggregates all of the media content for which you have permission. So whether the media content is in a private share, such as “cellison” below, or in folders named for media types, it’s all aggregated when you browse the library. If you click on Shared Folders, you’ll see your files displayed in a browser window similar to Figure 8. You can upload or download files, create new folders, copy, cut, paste and delete files. As with Windows explorer, the column heading lets you sort your files. This is a really nice file management interface. In the Media Library, you can browse pictures, music or videos. For pictures, you can see a traditional thumbnail view of each folder, or you can select Play slideshow. Alternatively, you can search the directory for a file name. Partial names may display multiple matches. Slideshow options are limited to duration: slow, medium or fast. The transition is “dissolve”, and you don’t have the ability to rotate any photos that may be oriented incorrectly. Figure 9 shows a slideshow in progress. You can navigate directly to any photo by clicking on the corresponding thumbnail on the right side of the screen. Up and down arrows allow you to navigate through all of the photos in a directory. Similarly, the Remote Web access for the Music library is also robust. Figure 10 shows that you can sort your music by Albums, Artists, Genre, Ratings, Playlists or Songs. Apparently the DX4000 reads the ID3 tags and organizes your library, as all I did was copy some folders onto the server. The server does have a DLNA-compliant media server, but not an iTunes server. Figure 11 shows what the player looks like as you are playing music. The moving background is a collage composed of all of your available album artwork. You can show the current queue, and you can also save queues to a playlist. Note: IE is showing a certificate error, as I’m connecting to the web remote access over my local network. There is no certificate error when you connect remotely over the Internet using the devicename.remotewebaccess.com address. I tested slideshows, playing music and playing video in both IE9 and FireFox 8, and everything worked in both browsers. It's worth noting that Windows Storage Server 2008 R2 Essentials supports on-the-fly video transcoding. Not many NASes do this, so the feature could be a plus for the DX4000. However, the Microsoft help note linked above notes that "To stream high definition video through Remote Access, you need a processor with a score of at least 6.0". Given that a notebook with an Intel i3-2310M, which is much more powerful than an Atom D525, has a score of only 4.6, you can probably forget about remotely viewing HD video. My only disappointment with remote access came when I tried to connect for a remote desktop session. Several of my computers were reported as a “not supported operating system” even though they were running Windows. In order to access the remote desktop via the Launchpad Remote Access feature, you must be using Internet Explorer, and have the remote desktop services ActiveX component installed (Figure 11b). I was able to connect to one of the computers, but not to the DX4000. For the one computer I connected to, it was a standard Windows remote desktop experience. Given WD's stated business focus for the Sentinel, it's odd to see so many media features. But I guess since they come with WSS 2008 R2 Essentials, WD figured they might as well pass them on to the user. Shared Folders - When you click on Shared Folders, it opens a window showing the shared folders that you have access to on the DX4000. Figure 12 shows my shares on the DX4000. Dashboard - This is just a shortcut to access the Dashboard program, which I'll discuss next. As noted earlier, the Dashboard is the administrator’s console. From here, you can add/manage users and shares, create computer backup profiles, restore files and monitor the health and status of the DX4000. Figure 13 shows the home page of the Dashboard. I’ll talk a little about each of the menus for the icons that run across the top of the screen. Users - This is where you can create user accounts and set password policies. However, the password policy only pertains to the password strength, and not how often the users have to change their passwords. You can also remove an account, deactivate it or change the account password. Figure 14 shows the properties for my account. As you can see, you can individually grant or deny remote web access on a user by user basis. Computers and Backup - In this menu, the organization is based on computers, not users. In Figure 15, the column in on the right shows the basic tasks available for each user. By default, the local RAID 5 volume as well as any attached USB drives are completely backed up. You have the option, however, for each computer, to create a custom backup that backs up only administrator-specified folders. Computer properties shows general information about the computer, as well as the backup history. The additional client computer backup tasks, shown in the lower right corner of the above screen, allow you to set global parameters for backups. You can specify a start and end time for the backup cycle as well as set a daily, weekly and monthly backup retention policy. In addition, you can create a USB boot key should you need to do a "bare metal" restore. While Launchpad supports backup of MacOS clients, you can't use any of the DX4000's storage as a target for Apple Time Machine backups. For some quick tests, I backed up an entire computer as well as selected directories on two other computers. While I didn’t create a USB bootable key to do a bare metal restore, I did restore some files from the server. I navigated to a backup session I made of one of the computers and selected the drive and directory I wanted to restore. After selecting it, I had the option of restoring files or directories to anywhere my computer had access to, but not to the original location on the original computer. I restored both to another NAS drive as well as to my local drive. I was surprised to see that Windows Explorer reported only about 1.45 MB/s while copying the restored files. Restoring from the DX4000 to another NAS, both connected by Gigabit Ethernet, was even slower. I’m glad I didn’t try to recover multiple Gigabytes of data! Server Folders and Hard drives - In this menu, you add, delete and move folders, stop sharing and view folder properties. New folders are added at the root of D:\ServerFolders, and cannot be added as a sub-folder to a currently shared folder. Also, none of the system-defined folders can be deleted. Figure 16 shows the Server Folders tab along with folder properties for cellison. You can see that my private folder has 8.4 GB of data. There is no provision within the DX4000 to apply user disk quotas! The sharing tab (not shown) displays user rights granted to the folder. The Hard Drives tab shows how the array is partitioned. For this model, there’s a 60 GB C drive and a 5528.8 GB D drive. Add-ins - In this menu, you can add additional features and functions to your server from Microsoft or other Independent Software Vendors (ISVs). Monitor - The Health tab gives you a summary of the status of your DX4000 as shown in Figure 17. The Software Update tab lets you specify when the server checks Western Digital for updates. By default, the server will check for updates every Sunday at 12:00 AM. WD warns you that an automatic reboot may be required after a successful update. Server Settings - When you click on Server Settings in the upper right hand corner, a separate window opens (Figure 18). The screens are quite simple, so I’ll just comment briefly on each one with the exception of Remote Web Access. Media - In this menu, you have the ability to enable/disable the media server, adjust the video streaming quality, rename the media server library, and determine which folders are to be included in the Media library. As a test, I included my cellison folder, and media files I placed in that folder appeared in the media library. Home Group - you have an option to join a Windows Homegroup. Remote Web Access - Figure 19 shows the Remote Web Access configuration page. You have the option of disabling Remote Web Access for all users. The repair button attempts to repair a broken connection. The server determines your public IP address (grayed out to obscure my public IP address) as well as your router type. More details shows you the IP address of your server. Clicking on the setup button next to domain name launches a wizard that takes you through the process of creating your own domain name. You merely choose a name and a domain from a dropdown box. The server checks to see if the domain is available and if so, sets up your server for remote access. It’s important to note that remote web access uses inbound ports 80 and 443. The DX4000 expects to use UPnP to configure your router, so make sure that you have UPnP enabled on the router. If your router doesn't support UPnP, you’ll need to manually forward the inbound ports to the IP address of your DX4000. So you'll probably want to make sure that the DX4000 has a static IP address. Also, be sure that you don’t have any other remote web-enabled devices on your network, such as web cameras, competing for those ports, or the DX4000 remote web access will fail. Domain - Here you can join the DX4000 to a Windows domain. I already had a preview of the RAID reinitialization time. But, of course, I still had to do the standard drive pull test. I started copying about 5 GB of music to the server and Windows 7 reported a copy speed of about 14.5 MB/s. I then pulled drive #4 and the file copy continued. After a few seconds, the front panel indicator light started to flash red, and the front panel LCD displayed STORAGE DEGRADED. At that point, file copy speed dropped to about 9 MB/s. A red critical alert showed up on the dashboard, which, when clicked, directed me to check to see if there were any missing or failed drives. Of course, I could have also set up email notifications, as well. Figure 20 shows the Dashboard alert for the failed drive. Before re-inserting the “failed” drive, I checked, and the Dashboard interface was still responsive. I reinserted the disk and it took the DX4000 about 20 seconds to recognize it. The status light turned solid blue and the LCD screen reported REPAIRING... I started to copy some additional music files while the repair was taking place, and the copy rate bounced between 1.36 and 1.76 MB/s, i.e. almost unusably slow. For some reason, the RAID volume repair initiated by the drive pull ran faster than the "reinitialization" caused by pulling the plug. It completed in about 15 hours vs. the 6+ days for the reinitialize. If we get an explanation of the stark difference between the two times, we'll let you know. I’ll have to admit, my initial out of box experience wasn’t a very positive one. The connector software initially failed to install on any of the three systems I tried it on. In all fairness, I decided to give the connector installation one final shot and installed it in a virtual machine running XP on my Mac. It installed flawlessly in about 24 minutes or so. Go figure. I have sent my log files to WD and will report back if they come up with a root cause for my installation woes. While the connector does allow for centralized backup and monitoring of connected systems, it can take up to 30 minutes to install, and only one installation can run at a time. For deployment in a medium-sized office, that could take quite a while. I also don’t like that the server management is done through a separate piece of software rather than through a web browser. Browser-based management on NAS products has been the standard for years. Note that you can always connect to the DX4000 via Windows Remote Desktop if you want direct access to tweak any knobs instead of going through Dashboard. My major complaint with the DX4000 is the extensive amount of time that it takes to rebuild the RAID in the case of a crash, failed disk or power outage. The poor performance experienced during the rebuild and the lack of fault tolerance during the rebuild may make this device unsuitable for some business environments. On the positive side, once I had the connectors installed and the device was functioning at full speed, I found the DX4000 easy to use and configure. The menu system is simple enough that it won’t overwhelm non-technical users. I really liked the web remote access and thought that media aggregation into libraries was a nice feature. I was a bit surprised, however, that media serving was an included feature for a device targeted at the business audience. Still, you can disable that function if you want to. Unfortunately, my experience using browser-based Remote Desktop via Remote Web Access was mixed. Even when I used Internet Explorer as required, it worked on some systems, and not on others and didn't work with the DX4000 itself. With all of the more fully-featured remote desktop products on the market such as LogMeIn and GoToMyPC, I’d probably choose one of them rather than be tied to Internet Explorer and Remote desktop. WD has work to do on its backup and restore features, too. I've already noted the lack of support for Apple Time Machine. But options for backing up the server itself are limited to attached drives. Backup to networked rsync targets or even other DX4000's haven't yet made it into the feature set, nor has backup to any cloud services. 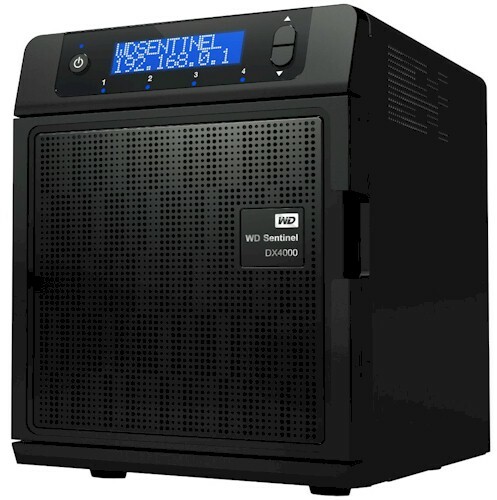 In all, while there are a number of features that I like about the DX4000, installation issues, slow RAID rebuild times, slow restore times and limited server backup options keep it off of my recommended purchase list.